We are very happy and excited to have Elise as a new contributor on the blog. She started her studies with a bachelor and a master in languages and modern literature before undertaking another master in cultural management in Brussels. After an internship for an international concert producing company in Helsinki, she felt in love with Finland and decided to stay. She is a passionate art lover, who will share with us the cutting-edge Finnish contemporary art scene, and Helsinki’s hot arty spots. This summer, two big Finnish names, Kiasma and Marimekko, are collaborating to please contemporary art, design and fashion lovers by jointly programming an exhibition rightly called Kimpassa/Together. Last month, I had the opportunity to discover it, and I am going to share with you my experience . But before that, let me introduce the context in which this exhibition has been built. If you have ever been to Helsinki, you probably have heard about the two important Finnish landmarks that are Kiasma and Marimekko. 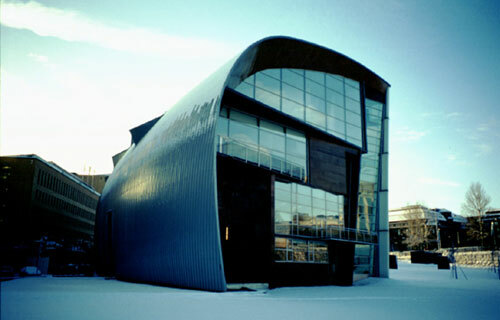 For those who don’t know, Kiasma is the Contemporary Art Museum of Helsinki. Opened in 1998, it is run by the Finnish National Gallery and is located in the heart of Helsinki. Frankly, I consider it as one of the best places in town for a proper art fix. The museum’s impressive building was designed by the American architect Steve Holl following the theme of light. Fascinated by the natural changes of light in Finnish seasons, the architect wanted to reflect this natural phenomenon as much as possible in his design. And it clearly stands out once you step inside. Holl’s choice to honour light is first reflected by the glass ceiling in the entrance lobby and other glass walls around the building but also by an alternation of shades as the visitor moves from the bigger to the more intimate exhibition rooms. The museum functions as a cultural place, a display of changing exhibitions and a meeting place. It also includes a theatre and conference rooms. In other words, the modern, based-on-nature building works mainly as a space to exchange ideas. 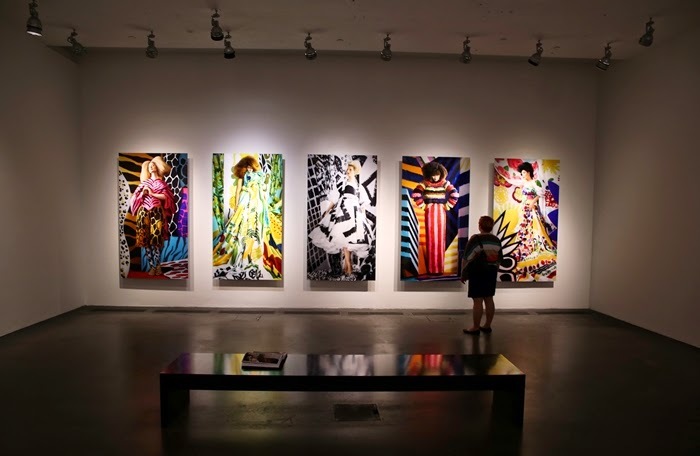 In this spirit of exchange, Kiasma offers this summer an exhibition jointly produced with the internationally renowned Finnish brand Marimekko. The famous fashion and design company was founded in 1951 by Armi Ratia and her husband. 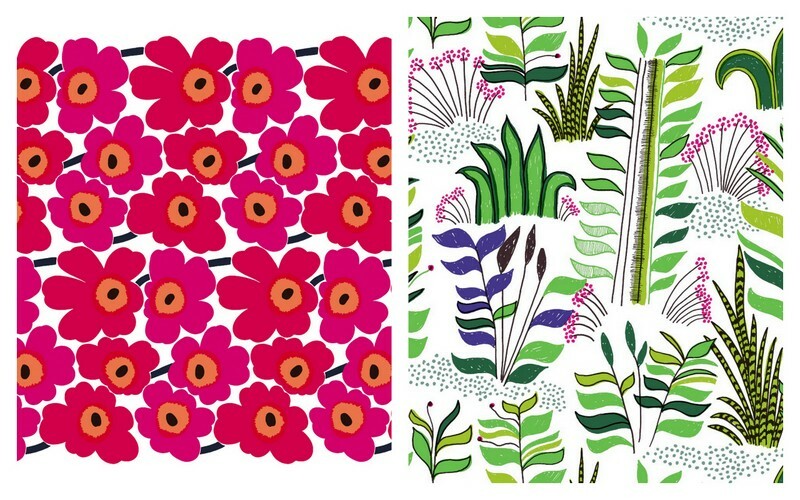 Marimekko became recognised around the world thanks to the contribution of two pioneering designers such as Vuokko Eskolin-Nurmesniemi, mother of the striped pattern in the 1950s and Maija Isola, creator of the iconic Unikko, the timeless poppy-shaped flower pattern which celebrates splendidly its 50th anniversary this year. In 2014, you can see this recognisable flower all around Helsinki in different sizes and colours. The brand is specialised in printed fabrics, women’s clothes, tableware and other decorating objects for the house designed by Finnish or international top artists. The success of the company probably comes partly from its values close to Finnish society. Indeed, Marimekko works for ‘an authentic flavour of life’, the products are designed to fit every type of customer and cultivate the interesting differences found in the Finnish ways of life. It is also a well-known fact that Scandinavia is very aware of the environment and most of the companies work in order to limit their environmental footprint. 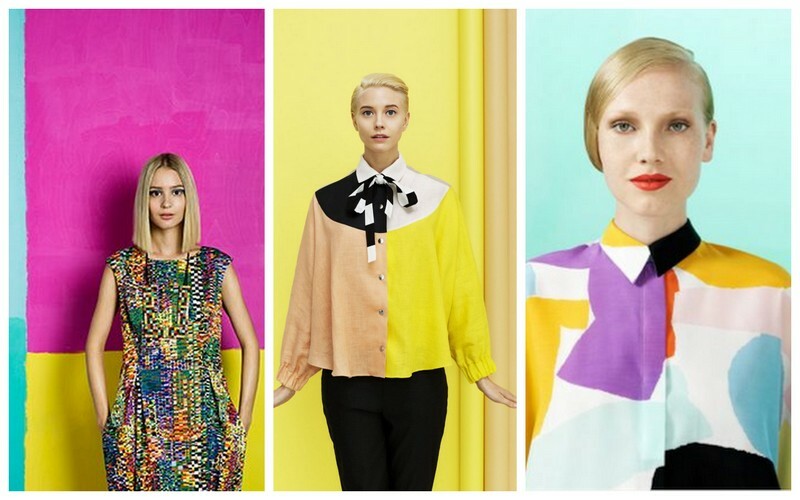 In this sense, Marimekko is known to create its products to last. Indeed, if you ever wander in one of the numerous Finnish summer flea markets, there are great chances that you might dig Marimekko fabrics or tableware from the 1960s or 1970s in perfect shape. You would also be able to recognise them easily as Marimekko’s goods are often caracterised by bright colours or strong black and white contrasts. Finns are very fond of their cultural heritage and design is an important part of it, therefore, since its outset, Marimekko plays a significant part in Finnish cultural identity. 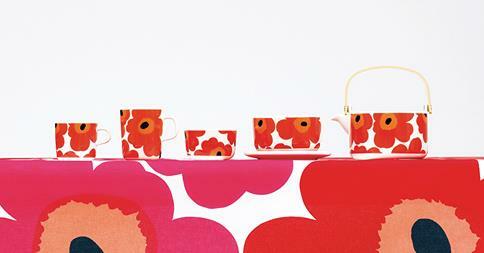 Unfortunately, the products of Marimekko are rather expensive because of their good quality. Despite that fact, I have to say that every Finn I know owns at least one piece designed by the company, be it a towel, a mug, curtains or even oven mitts. 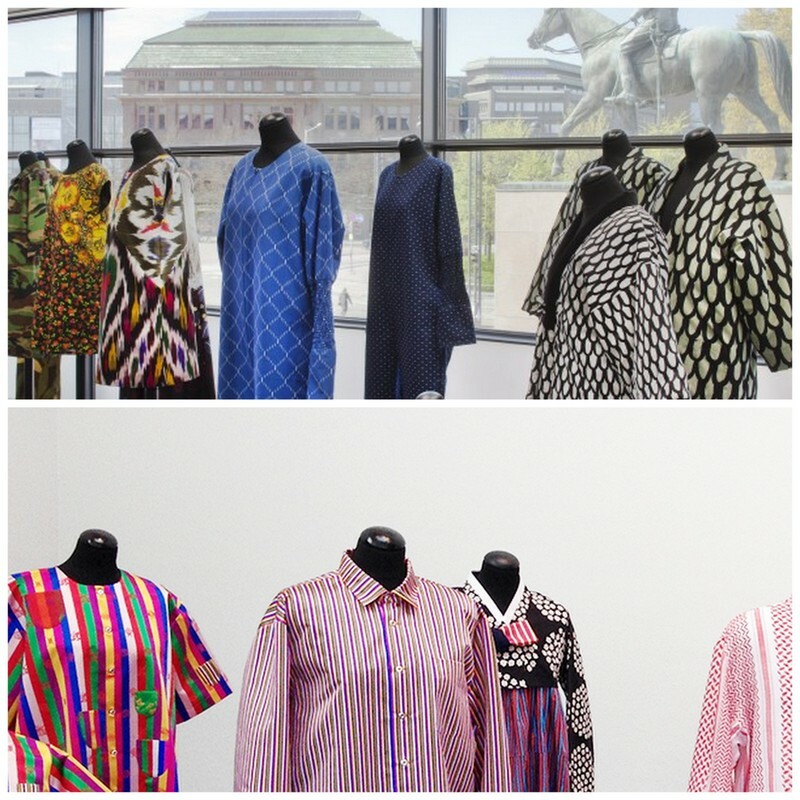 This year, in order to connect the design world to the contemporary art microcosm, Marimekko and Kiasma have combined their creative ideas to put up an interesting and varied exhibition. Sixteen artists having a connection to Kiasma and/or to Marimekko have been given ‘carte blanche’ to create, alone or in cooperation with other artists, a piece of art specially fit for the spaces at Kiasma. The exhibition seeks to promote and honour contemporary art, design and fashion. Paintings, photographs, sculptures, installations, ceramics and others have been specifically created to highlight the many links between design, fashion and contemporary art. According to me, the theme of this exhibition is rather vague and lacks clarity. Indeed, as not all the artists have ever worked with Marimekko or did not get influenced by the design brand to create their piece, I had troubles to find a link between the different pieces of the exhibit and its title. Even though some pieces were brilliant, they did not all correspond to the meaning I had in my mind of ‘Together’, the name given to the art display. As a Marimekko and Kiasma enthusiast, I also have to describe the show as rather short; its end comes too quickly. However, some works are definitely worth viewing thanks to their creativity, inventiveness or simply through the beauty of the colours used. The ‘Kimpassa/Together’ exhibition is on until the 9th of September. If you decide to visit Kiasma, do not forget to swing by the Alfredo Jaar’s ‘Tonight No Poetry Will Serve’ mind-opening exhibition questioning our moral and social values and our responsibility to other’s fate. 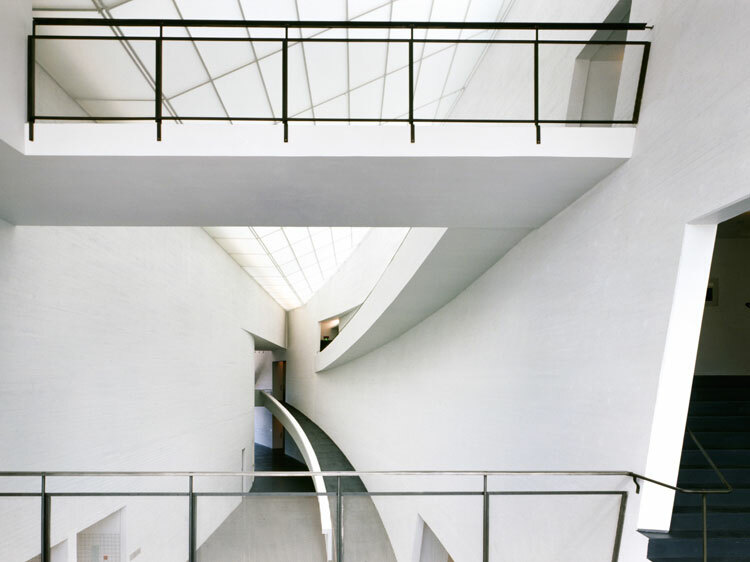 You can also discover the great Kiasma Hits, a mix of classic Finnish contemporary art pieces and new international acquisitions to the museum. Jaar’s exhibit and the Hits are on display until the 7th of September.You can visit Kiasma for free every first Friday of each month, from 16.00 to 20.30. Contemporary art lovers, hurry up! The museum will close its doors for renovations from September on to reopen in spring 2015, do not miss the chance to visit it this summer!